The great Heart and Soul star formation region, ionised by the Cas OB6 association, is most visible at radio frequencies. This image shows the major ionising stars, clusters and associations in this sector, including the Per OB1 association. Gart Westerhout first observed the prominent radio sources W3, W4 and W5 in this sector in the 1950s. Amateur astronomers more poetically describe the area as "Heart and Soul" because of the dramatic appearance of the nebulae at visual frequencies. In particular, the HII regions associated with W3 and W4 look like a human heart and the HII regions surrounding W5 look like a fetus or newborn infant. Per OB1, one of the greatest OB associations known in the outer galaxy, lies to the south. The Heart and Soul region is ionised by the Cas OB6 association and is one of the brightest parts of the Cassiopeia arc, which in turn is the brightest section of the Perseus arm visible from Earth. 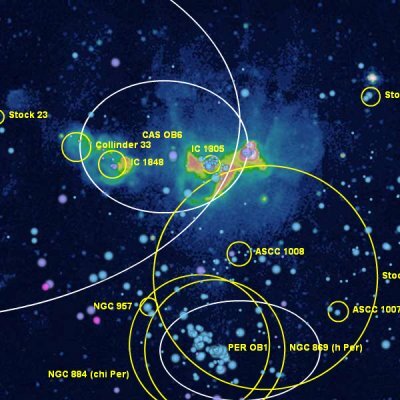 Cas OB6 contains two visible ionising star clusters - IC 1848 and IC 1805. Most of the Heart and Soul sector nebulae (but not all) are prominent at radio frequencies. Sh 2-191 and Sh 2-197 were mistakenly included in the Sharpless catalog and are, respectively, the galaxies Maffei 1 and Maffei 2. Sh 2-195 is located in the same direction as these galaxies but is apparently a Milky Way HII region. However, little of significance appears in the scientific literature about Sh 2-195. The Per OB1 association, which appears to be dominated by the famous Perseus double clusters h Per (NGC 869) and chi Per (NGC 884), lies south of Cas OB6. These 13-19 million year old clusters appear to lie at the same distance as the Heart and Soul region. , . Cappa and Herbstmeier identify 15 O-stars  in this direction (including one O4 and three O5) and Kharchenko lists more than 60 B-stars of class B2 or hotter in NGC 869 alone. The 6.9 million year old ionising star cluster NGC 957 also appears in a similar distance and direction as do the two newly discovered clusters ASCC 1007 and ASCC 1008. ,  Assuming that these stars are indeed all part of the same association, Per OB1 stands out as one of the greatest known OB associations in the outer galaxy. 13. 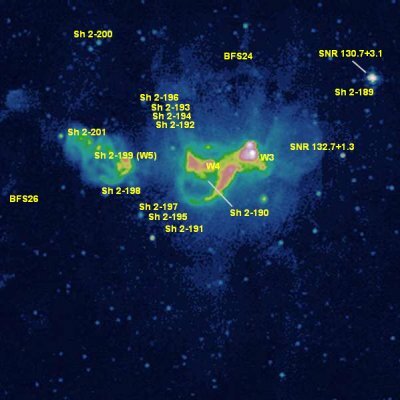 ^ Humphreys, R. M. 1978, Astrophysical Journal Supplement Series, Studies of luminous stars in nearby galaxies. I. Supergiants and O stars in the Milky Way. and the unpublished catalogs available here.